On global, Nissan is one of the most relied upon brands for delivering successful high-performance automobiles. As one of the biggest companies in Japan and a serious force in North America, its vehicles have a knack for turning heads - especially the recently introduced 2003 Z Concept car, which invokes the tradition of the company's classic Z series of cars (a series that many car collectors still covet today). 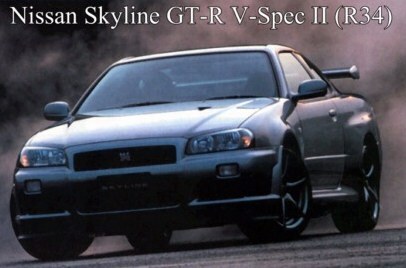 In Japan, the Skyline GT-R V-Spec II prides itself as Nissan's top of the line automobile in both style and performance. A sports car must never, even stop advancing even if its evolution is extremely minor. Stop evolving and it's over: The end of the advancement of a sports car is practically the same as its retirement. With its long history, the Nissan Skyline seems to be fully aware of this fact and thus in August 2000 underwent changes involving minor modifications and improvements. The top-of-the-line R34 Skyline GT-R has also managed to evolve steadily but slightly. The V-Spec II which is the new version replacing the V-Spec became the first production car to adopt a carbon-fiber engine hood with a NACA duct. In addition, the large-diameter rear brakes previously adopted only in the V-Spec N1 were made standard equipment in all GT-R models. The only changes that affect driving include new rear brakes and the adoption of a carbon-fiber engine hood with a NACA duct, but even then, the changes were definitely significant. Beefing up the rear brakes and changing the distribution of braking power have further improved the attitude stability during braking, giving a feeling of even higher quality in driving. The adoption of a carbon-fiber engine hood reduces weight and the NACA duct affects the engine cooling performance. For someone who needs the GT-R and wants to extend its performance to the limit, these two points are truly major changes and will be elements that will further mature the solid and rich driving character that the Skyline GT-R has. The Fairlady Z that appeared in July 1989 is a model, which predated the current crop of 280 hp super sports models. Up until the appearance of this Z32, the Fairlady Z was a car that had a more or less continental GT-type character, but with this model change its direction took a turn toward the real sports car. The styling broke with the traditional long nose, evolving into a wide and low form. The engine and chassis also adopted a configuration thoroughly devoted to driving. In order to avoid the long nose, the engine was changed from the straight-6 used in the previous model to the 3.0-liter V6 DOHC twin turbo VG30DETT. The naturally aspirated version is the VG30DE. The transmission choices include a 5-speed manual gearbox and a 4-speed automatic, but the 2-seater Version S only has a 5-speed manual. The suspension adopts a multi-link setup both front and rear. October 2000 unfortunately marked the end of the 11-year history of the Z32. Nissan's R390's are quite the force to be reckoned with in the S-class, and almost any of the seven versions of the Skyline GT-R are extremely dominant. Overall, Nissan has some excellent cars.